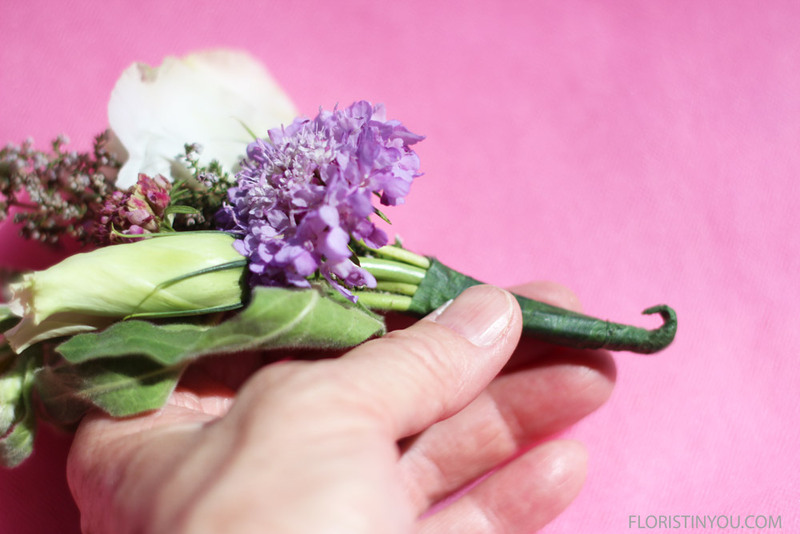 There are many times when it's really cool to know how to make a corsage. Whether it is for homecoming, prom, a formal dance, a wedding, or Mother's Day. Once you learn the techniques, then you can adapt and use your creativity to achieve the look that you want to match the colors you are using. If you have your flowers, ribbon and supplies, let's begin. You will use paddle wire and heavy duty scissors to cut it. Stick wire through calyx of Lisianthus flower. Bring wire down on both sides of the flower extending past about 1.5 inches. Cut 2 springs of Tweedia about 5 inches long. Add a piece of Calycina Heather about 5 inches long. 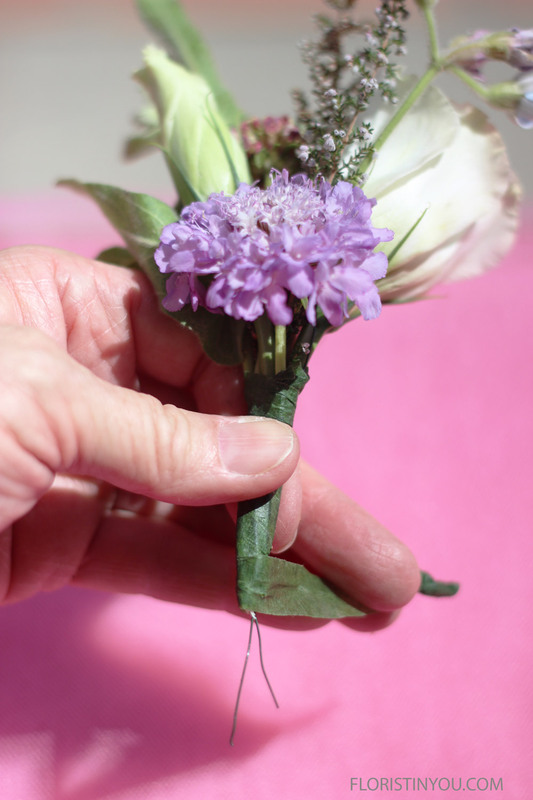 Wire through calyx of a Lisianthus bud cut 4.25 inches. Add 4 inch Burgundy Scabiosa. Add 3.5 inch Lavender Scabiosa. Add 2.5 inch Burgundy Scabiosa to right of Lavender Scabiosa. Wrap with floral tape. Double wire back and curve it. Then finish wrapping it. Cut 18.5 inches of 1/2 inch sheer pink ribbon. 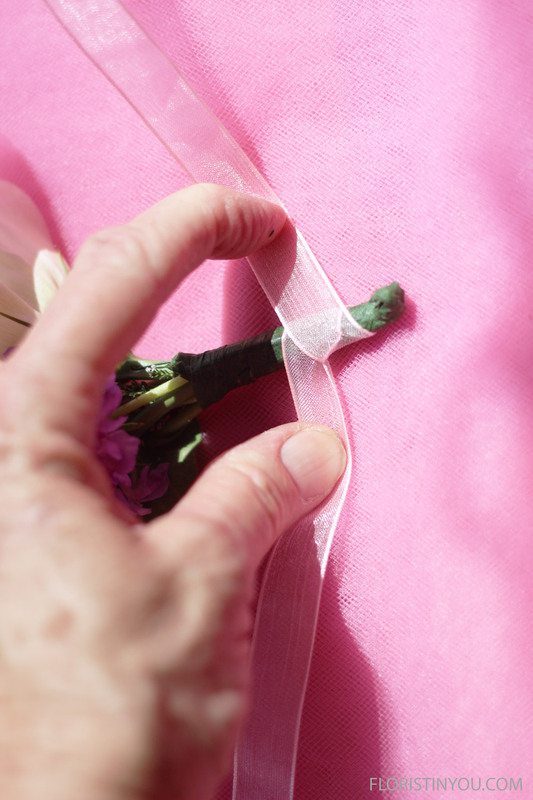 Place corsage in middle of ribbon. Wrap by crossing ribbon, wrapping, crossing, etc. Tie a bow. Cut ends at a 45 degree angle. You are done. Keep in a baggie, or clear plastic box in the refrigerator until it is time to wear it. Enjoy.